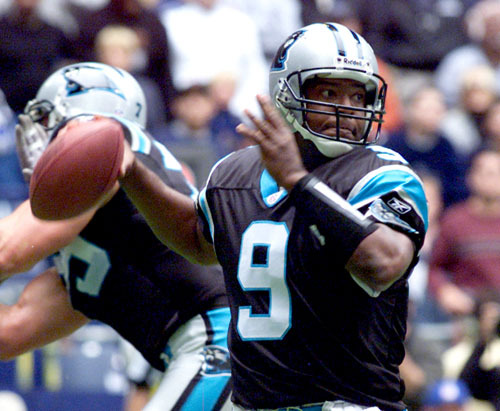 The Carolina Panthers won their first game of the 2001 NFL season – and proceeded to lose the remaining 15 straight contests, something no club in league history had done before. On September 8, 2002 they hosted the Baltimore Ravens, nearly a year to the day since their last win, with hopes of ending the skid as part of a new beginning for the franchise. George Seifert had been replaced as head coach by John Fox, formerly defensive coordinator of the Giants. The team also added DE Julius Peppers, the second overall pick in the ’02 draft out of North Carolina (the expansion Houston Texans had the first choice), and rookie RB DeShaun Foster from UCLA. RB Lamar Smith, a free agent signed away from Miami, was brought in to bolster the running game. And Coach Fox decided to bench QB Chris Weinke, who had suffered through a difficult first season starting for the 1-15 team, in favor of 36-year-old journeyman Rodney Peete (pictured above), who had been sitting on Oakland’s bench for two years and had not thrown a pass in a regular season game since he was with the Redskins in 1999. As for the visiting Ravens, coached by Brian Billick, they were two years removed from being a Super Bowl champion and had gone 10-6 in 2001. Defense had carried them to a title, but while they still had a strong nucleus of talent, salary cap problems had forced them to jettison several players. The offense would have a new starting quarterback as well in Chris Redman, a third-year player. RB Jamal Lewis, who was outstanding as a rookie for the 2000 Championship team, was back after missing all of ’01 due to a knee injury. Most of the scoring came in the first quarter. On their second possession of the game, the Ravens went 80 yards in 9 plays that featured a 22-yard pass completion from Redman to WR Brandon Stokley in a third-and-eight situation and a 36-yard pass play to WR Travis Taylor that got the ball to the Carolina 11 yard line. Redmon threw an eight-yard touchdown pass to WR Ron Johnson and, with Matt Stover’s successful extra point, Baltimore was ahead by 7-0. The Panthers, however, came right back with a scoring drive of their own that also covered 80 yards. Rodney Peete completed three passes, the second to WR Muhsin Muhammad for 33 yards and the third to TE Wesley Walls for a 20-yard TD. John Kasay, the last remaining original member of the Panthers, added the extra point to tie the contest. In the second quarter, and following a punt by the Ravens, Carolina went 40 yards in 10 plays to score again. Peete threw to Walls for 18 yards on a third-and-13 play and RB Nick Goings converted another third down with a 20-yard run to the Baltimore 12. John Kasay kicked a 27-yard field goal and the Panthers were up by three points. That was it for the scoring. Twice the Ravens moved into Carolina territory but were forced to punt, and the Panthers were consistently kept on their end of the field. A 47-yard field goal attempt by Stover late in the third quarter was unsuccessful. Midway through the final period, the Panthers put together a promising drive that reached the Baltimore 33 in ten plays, but Kasay’s 50-yard field goal attempt failed. With under two minutes remaining and the ball approaching midfield, Redman threw a pass that was deflected by Julius Peppers and intercepted by LB Dan Morgan, who returned it 22 yards, and that was it. Amid great celebration worthy of a postseason victory, Carolina came away a winner by the score of 10-7. “It just feels so incredible to finally win again and to finish a game and just put an end to all this misery,” said the 13-year veteran Wesley Walls, who had scored Carolina’s lone touchdown. The statistics reflected the low point total. The Ravens had the most total yards (289 to 265) while both teams had 15 first downs apiece. There was only one turnover – the game-clinching interception at the end – and the clubs combined for 13 punts. In a workmanlike performance, Rodney Peete completed 12 of 19 passes for 136 yards with a touchdown and no interceptions. Lamar Smith ran the ball 24 times for 84 yards. WR Steve Smith caught 4 passes for 38 yards and Wesley Walls also gained 38 yards on his two receptions that included a TD. For the Ravens, Chris Redman was successful on 20 of 34 throws for 218 yards with a TD and one picked off. Jamal Lewis gained 64 yards on 17 rushing attempts and gained 33 more on 4 catches. Brandon Stokley was the top receiver with 6 receptions for 83 yards. The Panthers doubled their win total of the previous year the next week against the Lions and reached 3-0 before dropping eight straight games. Still, they ended up with a much-improved 7-9 record that put them fourth in the NFC South. A year later they were NFC Champions – a remarkable two-year turnaround from 1-15 in 2001. Baltimore was also 7-9 to finish third in the AFC North. Rodney Peete enjoyed something of a resurgence in his last year as a starting quarterback (he lasted two more seasons as a backup). He completed 58.5 percent of his passes for a career-high 2630 yards and 15 touchdowns along with 14 interceptions. While his physical skills had declined, he provided solid leadership to the rebuilding club.